One of the supposed “perks” of working for yourself is the ability to work at any time. You no longer have to show up at an office and sit from 8 to 5 every day. Instead, you can roll out of bed whenever you want, take some time to catch up on whatever series you’re watching on Netflix, and eventually settle down to work. It sounds nice, but in reality, it’s a terrible habit to get in. Having set “office” or work hours can seem like a drag, but in reality they make running your business much easier. Let’s imagine for a minute that you like to start your day by grabbing coffee at a local coffee shop. Then one day you drive over, and they’re closed. No warning, they’re just suddenly not open at the time you expect them to be. Their posted hours now say, “sporadic”. Would you chance going back? Maybe. But would you be frustrated every time you THOUGHT they were open and it turned out they weren’t? Definitely. What if this was your website hosting companies’s support availability? If your website went down and you had no idea when support would get back to you? You’d probably change hosts. When you work weird hours and send emails at 2am on a Saturday night, you train clients to think you’re available around the clock. Without a set schedule, clients don’t know how long they reasonably need to wait to hear from you, or when it’s appropriate to call. This results in phone calls on a Sunday morning when you’re sleeping, or expecting responses to emails immediately on a Friday night. Setting office hours and making your clients aware of them prevents client frustration. It’s totally okay to take nights and weekends (or whenever you want) off, as long as clients are aware and you’re consistent. Being consistent is the main thing. If there’s a problem with a client’s website, but she knows you’ll be available in three hours, she knows how long she needs to wait before you’ll see her messages. But if there’s a problem with a client’s site and she has NO IDEA when you’ll be “in the office” she’s going to freak out and try every way she can think of to get in touch. Being inconsistent confuses your clients. Let them know when you’re available and when you’re not. Pro tip: if you’re answering emails outside of your set office hours, you can use Boomerang or Streak to schedule emails to send during your regular hours. And when you shouldn’t be. This allows you to focus on what you’re doing (or supposed to be doing) at the appropriate time. If you’ve ever found yourself at dinner and ignoring the person you’re with because you’re checking emails from clients, you need to stop. If you’ve ever found yourself browsing Pinterest for hours when you’re supposed to be making a client’s website, you need to stop. That means no 6-hour naps when you’re supposed to be working, and no email checking when you’re supposed to be relaxing. Being a small business owner your brain is always active, and you’re always thinking of things you should be doing. Being strict about the hours you’re working and the hours you’re not allows you to live a life outside of your work. And when inspiration DOES strike outside of your work hours, you can make a note and get back to it when you’re scheduled to be working. Pro tip: you can set your office hours to work with your schedule–they don’t need to be a regular 8-5. If you have a day job your office hours could be 6pm-10pm, as long as you and your clients both know what they are. When you don’t have an end to your workday, it’s easy to mess around on social media, watch some Netflix, and otherwise get distracted. But when you have a set cut-off time for your work day, you are able to focus and get more done. That looming deadline of the end of work motivates you to keep moving and accomplish more. Without set work hours and just items you need to get done “at some point” during the day, you lack motivation. And then you mess around on Facebook, in your email, and on Pinterest, which all distract you. Instead of getting done what you had intended, you get sidetracked and end up accomplishing less. You end up answering emails, and doing a million small things, instead of the big important tasks you had planned. Instead of reacting to projects and life as they come up, having office hours lets you fit things in your schedule where they make sense and keeps you in control. When you’re in control you’re able to be more productive, and actually work less. Pro tip: if you know you’re more productive at certain times of the day, schedule your day that way. For example, if you’re most productive in the morning, schedule your project work for the morning. If you’re least productive in the afternoon, use the afternoon for client calls or work that doesn’t require a lot of focus. Just reading this post doesn’t make a difference. You need to actually sit down and figure out your office hours. You don’t have to make them a regular 8-5, your hours can be whatever works best for you, as long as you are consistent with them. Once you have your office hours figured out, the next step is announcing them. Put your office hours in your email signature and/or autoresponder and on your website. Make it crystal-clear when you’re working and when you’re not. 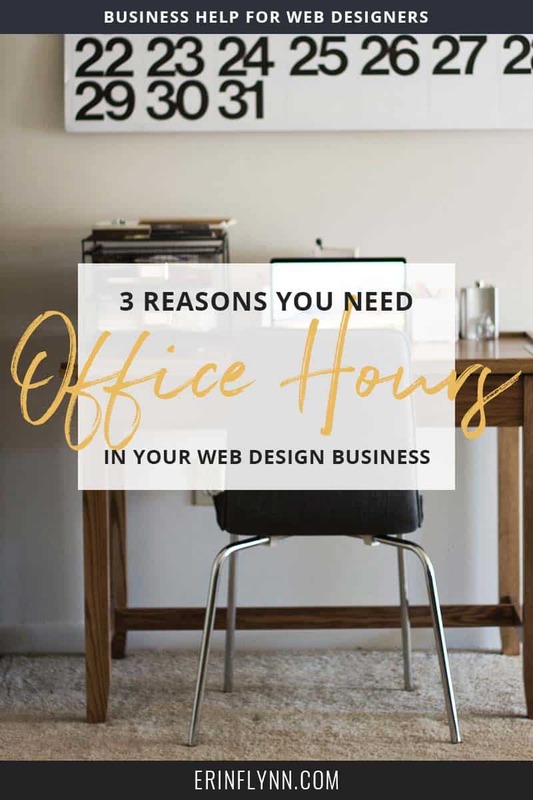 Take a few minutes and figure out your office hours–you’ll be happy you did!